Gorgeous bright parrot green peridot gemstone, set in a premium, wideband, sterling silver ring. Excellent clarity. Master-craftsman, hand cut really shows off the best aspects of the gemstone, ensuring outstanding lustre and sparkle. 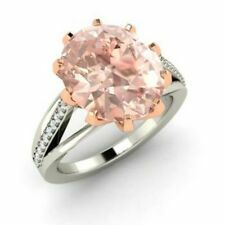 MORGANITE LIGHT PINK STONE RING ON STERLING SILVER BAND RING SIZE N. LOVELY SMOOTH FINISH TO RING AND VERY COMFORTABLE TO WEAR. The Morganite is mounted in an oval shaped Diamond halo with Diamonds below the halo & about 3/4 down the shank. The ring model is Jessica. The Diamonds are about a G in colour & SI in clarity. The ring is made of 14kt Rose Gold and size 6. 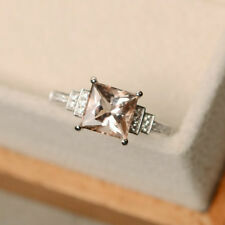 Wonderful peach pink Morganite set in a premium, wide band sterling silver ring. Eye clean clarity. Master-craftsman, hand cut really shows off the best aspects of the gemstone, ensuring outstanding lustre and sparkle. 0.42cts Zambezia Morganite Sterling Silver size L to M 0.42cts Zambezia Morganite Oval Shape 6mm x 4mm. Genuine Nigerian Morganite rare and beautiful, Clarity on these stones is fabulous. Morganite faceted into oval cuts 5 x 3.5 mm. Carat weight 0.96 carat. 9 carat, very heavy weight solid hallmarked ROSE gold - 4.29 grams - substantial on the hand. Main Morganite Carats: 2.5 carats – 8.5 mm x 10 mm. Gem type: Natural Morganite and White Topaz. 10 Round White Topaz Carats: 0.01 carats each – 1 mm wide. Iridescence is generally known as the property of certain surfaces that appear to change colour or the angle of illumination changes. A stunning and unique marquise cut morganite and pink sapphire band ring set into 9k rose gold. Secondary Stone Morganite. Main Stone Morganite. Main Stone Color Peach. CLEAR SAPPHIRE ACCENT STONES. Style Band. YOUR HAPPINESS IS THE MOST IMPORTANT THING TO US. IN SUNLIGHT, CANDLELIGHT, OR ACROSS A CROWDED ROOM, PRINCESS JEWELRY SPARKLE LIKE NOTHING ELSE ON EARTH. 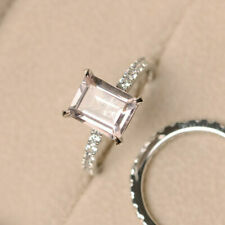 Main Stone Morganite, Diamond. Main Stone Creation Lab-Created, Natural(Diamond). Main Stone Shape Cushion, Round. Main Stone Color Pink, White. Diamond Color I - J. Secondary Stone Diamond. Ring Size 7. Color Stones Change (White Topaz, Blue Sapphire, Ruby etc). Diamond Type - Natural, Real. Diamond Cut - Excellent. Diamond Color - I-J. Diamond Clarity - SI1. You can customize the following things Color Stones ( Red / Green / Yellow / Blue / Black ). Box shown in image may differ as per availability. If you have any queries related to the product or service you canexpect a reply within 12-48 hours of inquiry. This gorgeous ring is made of 14k rose gold. 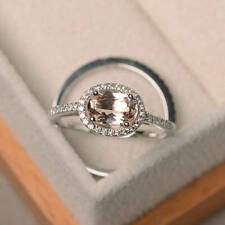 The ring has two beautiful round cut natural morganite stones. The ring also has 18 small pave set round brilliant cut diamonds. The diamonds are very sparkly, H color and VS2 clarity. Gemstone Typ eNatural Morganite. We specialize in White Gold, Yellow Gold, 14K ,! Diamond Type Natural Diamond. Total Gemstone Wt 3 ct. Side Diamond Shape Round.